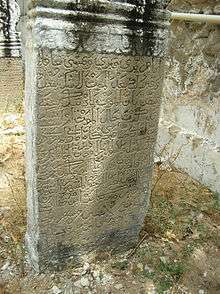 Arwi Arabic script in a tombstone at Kilakarai in one of the oldest mosques of India, the Old Jumma Masjid of Kilakarai. Arwi (لسان الأروي lisān-ul-arwī or lisān al-arwi; lit. "the Arwi tongue"; அரபு-தமிழ் arabu-tamil or Arabo-Tamil) is a written register of the Tamil language that uses an Arabic alphabet. It typically has extensive lexical influences from the Arabic language. Arwi was used extensively by the Muslim minority of Tamil Nadu state of India and Sri Lanka. The majority of Madrasas still teach the basics of Arwi as part of their curricula. Arwi was an outcome of the cultural synthesis between seafaring Arabs and Tamil-speaking Muslims of Tamil Nadu. It had a rich body of work in jurisprudence, sufism, law, medicine, and sexology, of which little has been preserved. It was used as a bridge language for Tamil Muslims to learn Arabic. Many hadith manuscripts have been found. Most of the fiqh books, particularly those of Imaam Shaafi and Imaam Abu Hanifa, have been found in Arwi. There was also a translation of the Bible into Arwi in 1926. Arwi contributed immensely to the education and progression of Muslim women in South India and Sri Lanka. Arwi-educated women were active participants in the social fabric of society playing vital roles in education, medicine and even politics. Large portions of Arwi works were lost in two periods of time: in the 16th century with the arrival of the Portuguese and in the 20th century with the arrival of the mainstream printing press. Using the Arabic script meant that Arwi could not jump to print easily. Presently, manuscripts are being eaten away by termites in homes and in private, public and institutional libraries. Efforts are underway to halt the decline and revive the language. Arwi still has a place among the more traditional Indian Tamil Muslim and Sri Lankan Moor families. 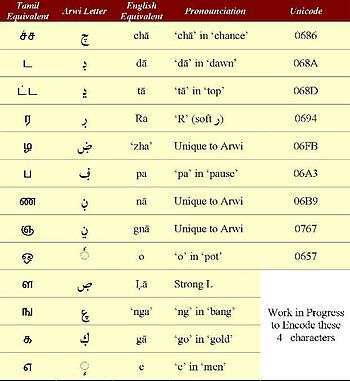 The Arwi alphabet is the Arabic alphabet with thirteen additional letters, used to represent the Tamil vowels e and o and several Tamil consonants that could not be mapped to Arabic sounds. 1 2 3 4 Torsten Tschacher (2001). Islam in Tamilnadu: Varia. (Südasienwissenschaftliche Arbeitsblätter 2.) Halle: Martin-Luther-Universität Halle-Wittenberg. ISBN 3-86010-627-9. (Online versions available on the websites of the university libraries at Heidelberg and Halle: http://archiv.ub.uni-heidelberg.de/savifadok/volltexte/2009/1087/pdf/Tschacher.pdf and http://www.suedasien.uni-halle.de/SAWA/Tschacher.pdf). Shu’ayb, Tayka. Arabic, Arwi and Persian in Sarandib and Tamil Nadu. Madras: Imāmul 'Arūs Trust, 1993.